A Denver B-Cycle docking station. Photo: Denver Urbanism Blog. This story by Loren M. Hansen is cross-posted with the Denver Urbanism Blog. This past Wednesday, Mayor Hancock announced that B-Cycle would be offering 5,280 free memberships to Denver B-Cycle for the entirety of 2019. As an avid cyclist and someone that wants to see a culture of cycling grow in the city of Denver, the news was incredibly heartening to me. However, with the recent growth of dockless rideshare and the decline in popularity of B-Cycle, can the 5280 Program help revitalize B-Cycle as a nonprofit? While the companies and services in the Dockless Mobility Vehicle Pilot Permit Program haven’t produced a Denver-centric annual report due to the recency of the launch of the program, scooters and electric bikes have become a part of the fabric of the city. Lime, for example, in its overall one year report noted that 6 million rides a month had been reached by June of 2018 worldwide, and the results have been seen throughout Denver and other major cities, where the rideshares proliferate in major urban centers. B-Cycle in Denver, on the other hand, has been in decline for the past four years, with ridership falling since its peak in 2014 to average a little under 360,000 rides per year, with 344,256 being the most recent figure. Please note: Throughout the next section, I will be mostly focusing on the period between 2014-2017 when it comes to ridership, mainly due to the fact that, outside of the subscription models, overall size of the B-Cycle fleet, number of stations, and days of operation remained relatively constant. I will also be using the words “subscribers” and “riders” interchangeably to refer to people that ride B-cycle, regardless of level of membership. The numbers are based on the 2017 annual report, which can be found here. The major assumption, which is borne out by comparing annual subscription ridership versus more short-term programs, is that increasing overall annual subscriptions will increase overall ridership, helping to boost the success of the program. 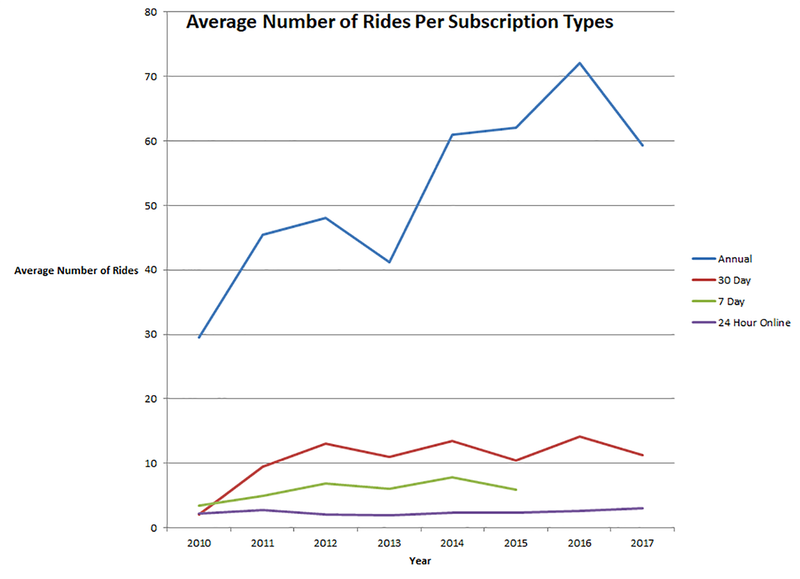 The data bear it out as well, as annual riders tend to average about 63–64 rides per year versus about 12 rides for 30-day subscribers, a little under 6 rides for the discontinued 7-day pass program, and 2–3 rides for 24-hour subscribers. The chart below shows the average number of rides each different group of subscribers contributes to the program each year. Between the four major subscription models throughout B Cycle’s existence, the Annual pass unsurprisingly draws the most amount of ridership. In fact, given the high average number of rides from annual users, the total amount of rides on B-Cycle can almost perfectly be correlated with the number of annual subscriptions, with the outliers being explained by the increase in service days from 288 to year-round (2013–2014) and restructuring of other subscription models, such as discontinuation of the 7-day pass in 2015 causing a steeper drop in 2016. The similarity of the charts below, however, suggests that annual passholders are the “anchor” to most of B-Cycle’s success. Outside of a couple minor discrepancies explained by service increases and subscription model changes, total annual passholders is a great predictor of total B-Cycle ridership. While 2018’s numbers haven’t been finalized at the time of this writing, if every free annual pass offered in the 5280 Program is redeemed and used at the same rate that passes were used in 2017 and everything else remaining constant, B-Cycle would see its ridership almost double to over 650,000 rides a year. To illustrate how dramatic of a jump this would be, here are what those projected totals would look like in 2019 with those assumptions. From crunching the numbers, this seems like this would be a great thing for increasing ridership throughout the city and getting people out of their cars. However, like with most programs, there are some possible issues with implementation. Sustainability: While the program is free for the entire 2019 calendar year, it begs the obvious question: is it sustainable? What happens on January 1, 2020 when the program is over and over 5,000 subscribers find out that they have to pay the annual rate of $75 versus their membership being free? Will the promised buildout of bike lanes coupled with this create “induced demand” for more cycling? Or will we see ridership decline sharply in 2020 as the program screeches to a halt, similar to the drop off we had from 2017 to 2018? Reach: Given that the B-Cycle office is only open during regular business hours (7:00 AM–6:00 PM Monday–Friday) and the only alternative is email, there is the possibility that this program may not reach some of the demographics that would most benefit from this program, including some low-income individuals. Along with this, the lack of B-Cycle stations in some areas, such as the northwestern (for now) and southeastern parts of Denver may dissuade people from signing up and sticking around if there is no substantive station development. Competition: Though current B-Cycle Executive Director Michael Pletsh has stated in the past that several of the structural changes to the program are not related to the rise of services such as Lime, Bird, and Jump, these entities do exist and have a vested interest in competing against B-Cycle. The possibility of having a competitor service gain over 5,000 customers overnight may warrant some sort of response from the five ride-sharing companies. While on the surface, the 5280 Program is beneficial for expanding B-Cycle ridership dramatically in the short term, this growth needs to be cultivated and sustained. Creating a community around the 5280 Program, including sponsoring group rides and encouraging new subscribers to renew once the program is over, will sustain B-Cycle and breathe new life not only into B-Cycle, but into the vibrant cycling community of Denver. BCycle is a division of Trek that supplies equipment to bike shares across the US. Denver Bike Share is the non profit that runs Denver B-cycle. Based on the numbers provided above. Annual members had 0.18 rides per day, 30 day members had 0.4/day, 7 day had 0.85/day and 24 hour members had 2 rides/day. So while the number of Annual rides/membership is higher, it’s actually a much lower use rate per day than the shorter memberships. If people decide not to ride the stupid B-Cycles, nothing is going to them. How many tax dollars went to this boondoggle…? 5,280 memberships at seventy-five dollars a piece for one year equals $396,000. Who pays the tab? The taxpayer, in the form of fees voters have no say in. Another example of the Hancock administration at work. Remember THAT come election day.